Look-ahead bias is common in backtests by novice strategy developers but results affected by it are frequently displayed in social media and financial blogosphere. 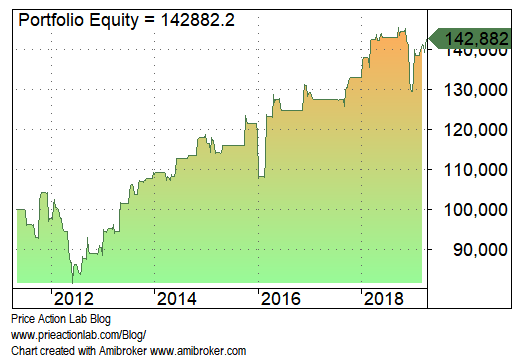 I wrote the article “Look-Ahead Bias and How to Detect it” three years ago after visiting the website of a quant hedge fund and realizing that they were actually marketing results affected by bias, as my analysis showed. Look-ahead bias is a serious error. In a nutshell it is caused by entry signals that are affected by knowledge of future conditions. In real trading the future is unknown but the bias in backtests may result in unrealistic performance figures. What is unrealistic? In my opinion, any backtest results with annual return in access of 10% and Sharpe ratio greater than 1 must be carefully scrutinized for the presence of bias. Below is a recent example from my own work. 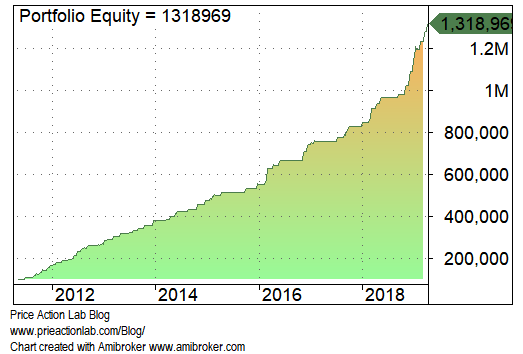 A few days ago, after programming a strategy (late at night) I obtained the following equity curve. I looked at the code and in the beginning I could not find anything wrong. But after spending about two hours trying a few things I discovered the source of the look-ahead bias. Below is the actual equity curve. Annualized return is about 4.5% and Sharpe is 0.41. This is more reasonable and what is expected from an “average intelligence’ hypothesis that one was. I suspect that look-ahead bias has been used purposely to impress people. But the non-intentional aspect of it has probably affected some quant hedge funds that delegate strategy development work to programmers who are very good in what they do but have little experience with backtesting and strategy analysis. After all, markets are not very generous in rewarding backtests, as anyone with skin-in-the-game knows. Disclaimer: All performance results are based on backtests. No part of the analysis in this blog constitutes trade recommendation. The past performance of any trading system or methodology is not necessarily indicative of future results. Read the full disclaimer here.